A new participatory certification system is providing agricultural producers and processors from the Pacific with easier access to organic markets. Although a significant share is already exported within the sub-region, the aim of locally and participatory certified organic producers is to find new outlets, particularly in the tourist industry. This offers significant potential for local producers and enterprises if they receive appropriate policy support. Organic production in the Pacific is on the rise. Since 2010, organic certified farms have increased four-fold (72,000 ha in 2016), and this trend looks set to continue. "The organic market remains largely untapped in the Pacific. It is up to us to make arrangements to supply it with produce," explains Stephen Hazelman, board member of the Pacific Organic and Ethical Trade Community (POETCom). With members from 17 Pacific island countries, POETCom has been supporting the sector since 2009. A large share of the region's organic products are exported to Australia, the EU, Japan and New Zealand. The first to benefit from the organic boom in these markets were long-established players in the organic sector, including the Samoa-based Women in Business Development, Inc (WIBDI), which was created in 1991. Between 2012 and 2013, the company doubled its production of virgin coconut oil; around 200 organically certified farmers are now the sole suppliers of virgin coconut oil to The Body Shop, which buys around 20 t each year from WIBDI. To certify its products, WIBDI uses the National Association for Sustainable Agriculture, Australia. Controls by external third-party bodies have long been the only way for Pacific island states to promote organic products. However, the high cost (approximately €2,000 for the producer) has restricted this market to the most lucrative businesses. “Many products from the Pacific can only access organic markets if they are certified organic, which may seem fairly ironic because traditional farming in the Pacific is very similar to organic farming. Yet obtaining certification is very costly. Those who do obtain certification, however, benefit from unique access for their products,” states Kyle Stice, manager of the Pacific Island Farmer Organisation Network. Today, organic certification is becoming more accessible. The creation of a Pacific Organic Standard (POS) is gradually expanding the foundations of organic production. Driven by POETCom since 2008, this pioneering initiative has adapted the rules for organic farming to the local context. The POS has, in particular, revealed technical issues, such as how the system can function without locally available organic seeds. 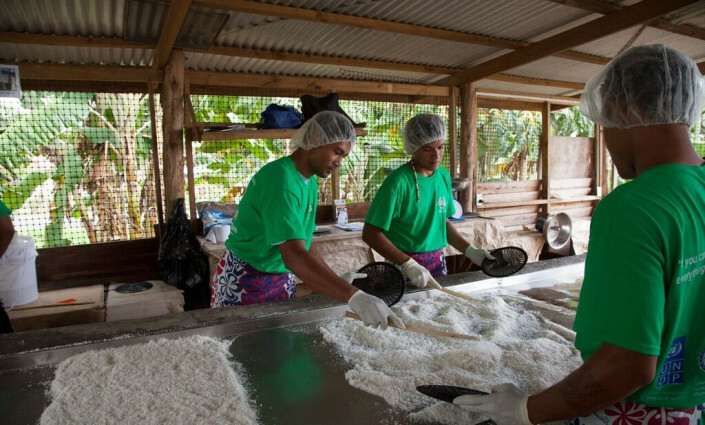 This standard and its label, Organic Pasifika, have opened the way for an alternative certification scheme: the organic Participatory Guarantee System (PGS) – which has been taken up elsewhere in the world – relies on controls set by the farmers themselves. According to Hélène Moquet, from Bio Calédonia, a pioneer of PGS in the Pacific, this system is a hundred times cheaper for producers than traditional certification (at around €20). Producers and processors are therefore embracing PGS to carve themselves a niche in the organic market. Six PGSs have been approved by POETCom to use the Organic Pasifika Mark which verifies their compliance with POS. Approximately another six are under development including a Vanuatu PGS – being implemented by Farm Support Association – and established local businesses such as Tanna Coffee, which is made up of 700 small coffee farmers. Unsurprisingly, one major local outlet is the tourist sector. In Fiji, local organic products are on the rise in hotels, airports and specialist shops. To further expand on this opportunity POETCom has developed an organic tourism standard. It creates the opportunity for hospitality providers to have their whole destination, a restaurant or even a specific menu item organically certified and include this as part of their marketing and promotion. The enthusiasm for organic products is also apparent among political leaders. The region pays a high price for its dependency on poor quality imported foods. In the face of the obesity and diabetes epidemics, the supply of fresh and nutritious products is becoming a health priority. Organic farming is also in line with the Pacific Island States' environmental positions in climate negotiations. But, while organic produce is much discussed, are institutional support measures being introduced? Only slowly, according to Hazelman, hence POETCom’s recent introduction of a Policy Tool Kit to help policymakers turn words into action.